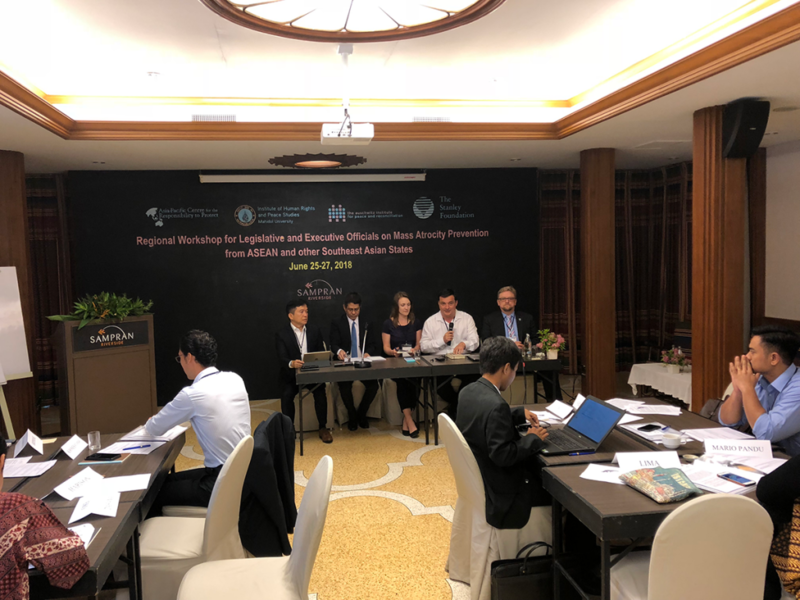 On June 25-27, 2018, the Auschwitz Institute for Peace and Reconciliation (AIPR) joined with The Stanley Foundation, the Asia-Pacific Centre for the Responsibility to Protect (APR2P), and the Institute for Human Rights and Peace Studies (IHRP) at Mahidol University to hold a regional workshop for legislative and executive officials from ASEAN and other Southeast Asian states on mass atrocity prevention. The three-day event, held in Nakorn Pathom, Thailand, represented AIPR’s first fully-fledged program in the region. 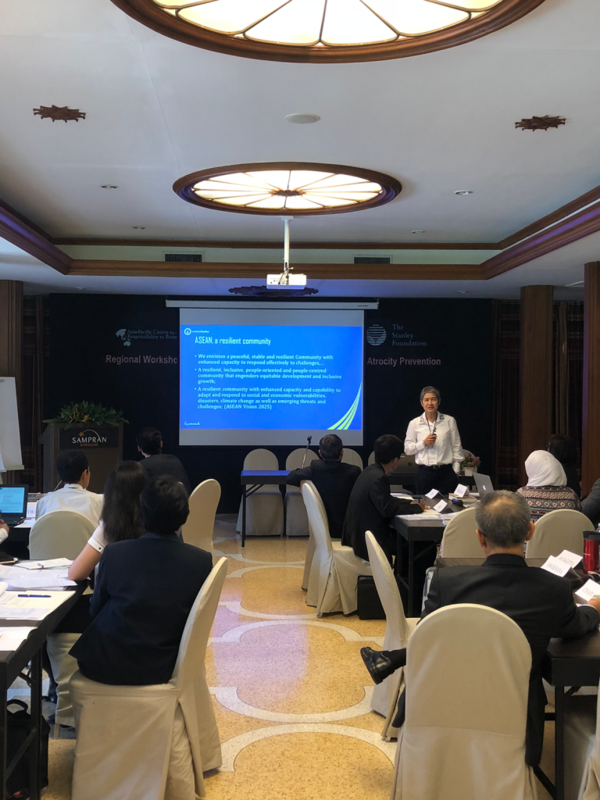 The workshop welcomed 20 participants from across Southeast Asia, representing governmental bodies, academic institutions, and civil society organizations. Public officials from both the executive and legislative branches of government were present, allowing for a wide range of experiences and perspectives to be shared and discussed. The event also provided an opportunity for parliamentarians and executive branch officials to work collaboratively and utilize the complementarity of their roles in the design of robust policies for the prevention of mass atrocities. 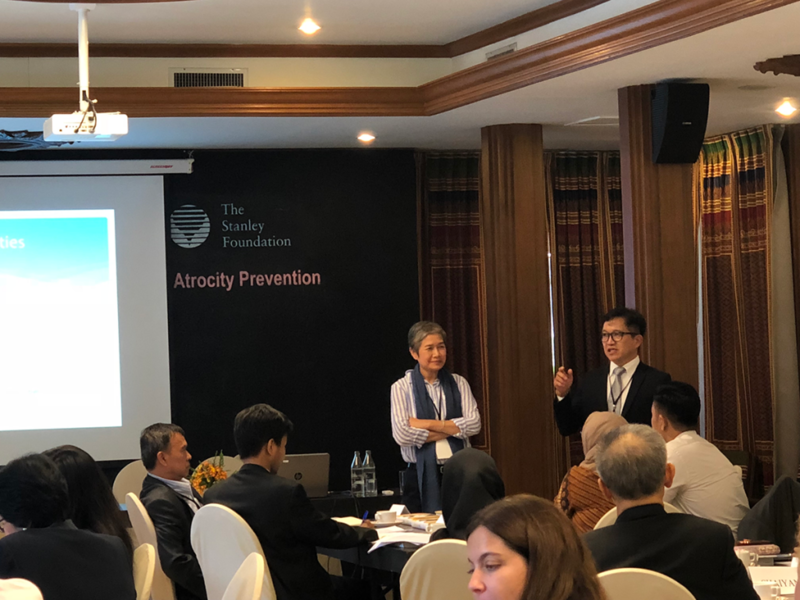 Following an introductory ceremony that featured remarks by representatives of AIPR, The Stanley Foundation, APR2P, and IHRP, the first instructional day began with a module introducing participants to foundational concepts of genocide, mass atrocities, and their prevention. 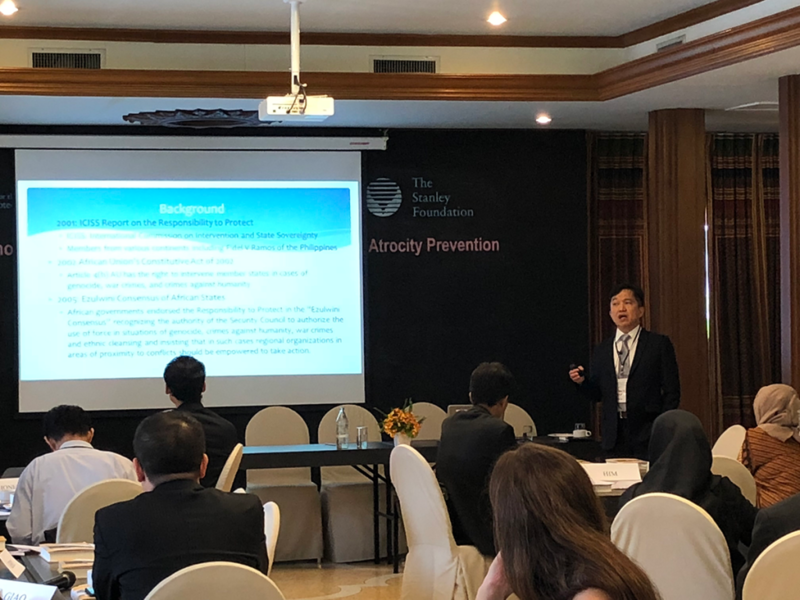 The day continued with an overview of the norm of the Responsibility to Protect and a module dedicated to existing international responsibilities related to genocide and mass atrocity prevention before concluding with a segment highlighting challenges to effective prevention in the Southeast Asian region. The second day of the workshop was devoted to the theme of building resilience in deeply divided societies. Following the days’ introduction, a module highlighting case studies on the importance of human rights in the construction of resilient societies was convened, followed by another on the work of National Mechanisms for the Prevention of Genocide and other Atrocity Crimes. The day was then concluded following a module on perpetrator psychology and another on the role played by women in building resilient societies. The final day of the event was dedicated to methods of dealing with the past in post-conflict societies. After brief introductory remarks, an introduction to transitional justice featured as the first module of the day, followed by a deeper dive on the role of memory and memorialization within transitional justice. 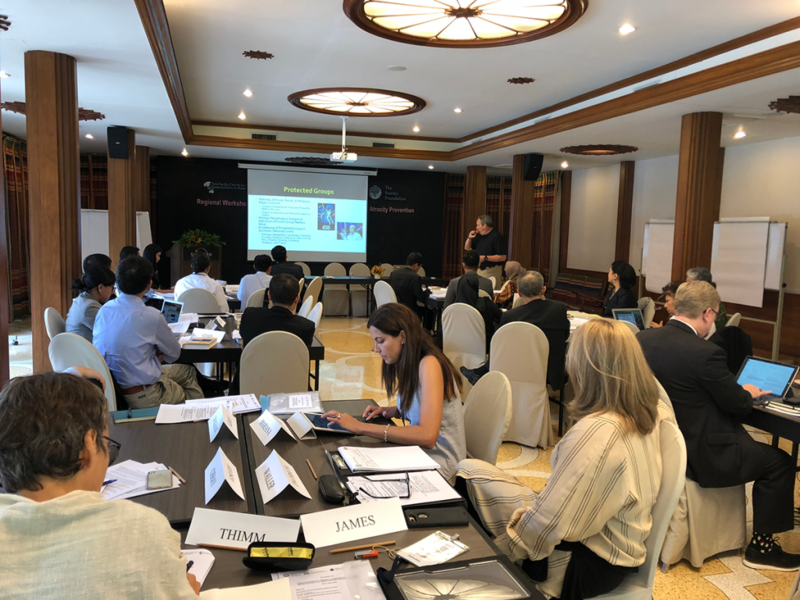 Next, participants examined a case study on the Tuol Sleng Genocide Museum in Cambodia and considered its character as a site of memory and memorialization. The workshop was then brought to a close with an interactive discussion module for attendees to discuss the route forward for prevention in the region. 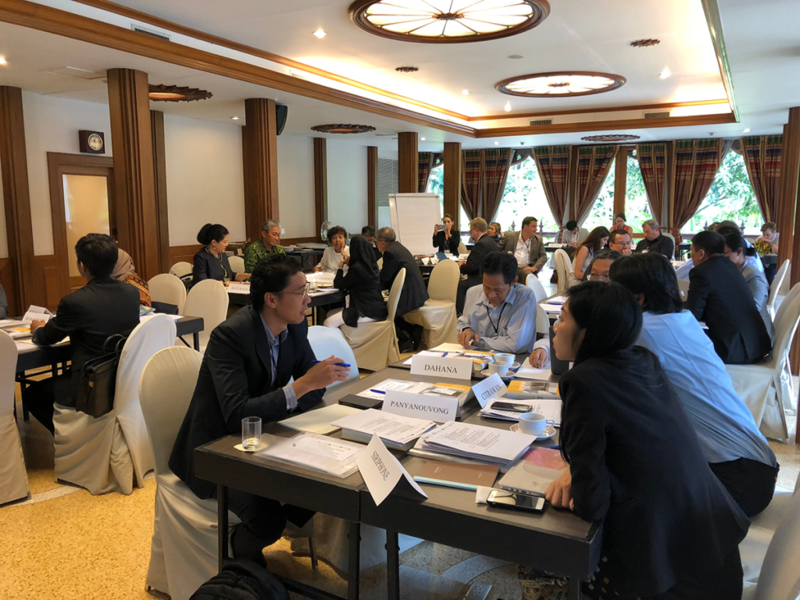 The Auschwitz Institute’s first high-level workshop in the Southeast Asian region created an opportunity to empower a range of participating actors with the knowledge and skills necessary to prevent mass atrocities. The event also emphasized the collaborative relationship that must be maintained between executive and legislative officials in order to implement policies and practices for effective prevention. The diversity of participants, who represented a multitude of national and professional contexts, allowed for discussions to benefit from a variety of approaches and highlighted the attendees’ broad interest in finding opportunities for the further implementation of the Responsibility to Protect and other preventive practices.